When you’re getting ready to sell your Blue Springs home, you’ll want to make sure you have everything working in your favor. Depending on your neighborhood, there might be several similar homes on the market, all with similar amenities. If you want to sell your house quickly, it has to stand out and feel special. Do your homework, and know exactly what your home is worth. Setting a specific price will show prospective buyers that you know what you are talking about, and have invested in maintaining the quality of the home. Round numbers can make it seem like you have no idea what you’re doing. “$150k? That sounds about right!” Instead work with your agent to determine the optimum asking price for your home and stick to it. In addition, avoid listing something using a whole mess of 9’s. “Our home is $299,999.99!.” People see through this and can make you seem gimmicky. This isn’t what people are looking for when making such a large purchase. However if you picked something like $196,000 its a good round number that is not too round. Also keep in mind major price search point. So if your home would appeal and probably sell at somewhere close to $200,000, having the listing at $199,900 is better than $201,000 as it will come up in more searches. The person searching for $200, 000 and below would never see your listing if it was at $201,000. You don’t need to burn your basil, rain, lavender blend incense. But you do want to make sure there is a light and pleasant smell throughout. People love the smell of a freshly cleaned home. Don’t go crazy with the bleach or any other cleaning solution, the less cleaning smell the better. And add in a pleasant citrus or baked good scent, these aromas are universally appealing, just don’t let them become overpowering. And always…. always, let the light in. Open the curtains, the blinds and turn on a light if you have to. Dark and shadowy places are often ignored. We look at so many houses that are almost perfect, or at least perfect for the price, but because the trees cover the windows from the outside and old, heavy grandma-ish draperties that went out with avocado and harvest gold cover the windows, the rooms seem dark, dingy and small. Trim back the trees and shrubs for not only curb appeal, but light and get rid of the heavy drapery and wash those windows. It will make your house look cleaner, nicer and often times bigger. This will also make the selling process easier for you. Putting your personal effects away will give you a head-start in leaving the place you’ve called home. Being emotionally ready to sell will make the whole process less stressful. Some sellers get freaked out over dead things, so no dear heads over the fireplace. We know you love to hunt, but the camo sofa has got to go. And while we have nothing against religion, too many icons can turn people off. Have other hobbies – collecting dolls, fishing tackle, clowns . . . box it all up and get it out of the house. Don’t forget to invite the neighbors and tell them to invite their friends that might be looking for a home. Often when we buy a house to resell or when we list it, the next door neighbor or their friends are the ones who end up buying it. Other times, a friend that was invited, will come back later in the day or the next day with their Realtor to make an offer. So if your agent tells you that open houses don’t sell, tell them they are just plain wrong. Of course to hold a house open, the house must be in party condition. If it needs a lot in repairs and updates, you may or may not want to hold the home open. If it is stinky and sticky as we talked about in our last post, well you might not want to hold an open house. 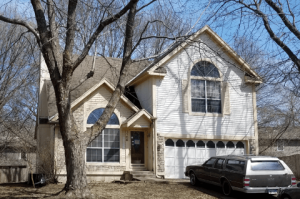 If you are ready to sell your Blue Springs home, we can help you with our innovative approaches! Fill out this quick form and we will be in touch right away!